The NFL in 2019 is a passing league, nobody denies that. However, teams with a balanced offensive attack are that much more difficult to defend. Even Drew Brees would find it tough to complete passes when there are constantly seven or even eight defenders dropped back into coverage. This is why finding a capable, versatile running back that can take pressure off the passing game is an undervalued asset in most drafts. Think of names like Ezekiel Elliot or Saquon Barkley; these two players were top 5 draft choices that are able to change the game and carry their offenses. Now think of guys like Frank Gore and James Conner; two players drafted in the third round that have been significant contributors to their team. My point being, despite being a passing league, running backs can have a significant impact to any team, in any round of the draft. Which brings me to David Montgomery from Iowa State. The 5-11 216 pound running back has been a standout player for Iowa State during his junior year, rushing for over 1200 yards and 13 touchdowns. He averaged just under 5 yards per carry, while also contributing another 157 yards in the passing game. While these numbers were good enough to land him in the top 35 rushers nationwide, let’s remember that he wasn’t facing elite competition; and there is obviously room to grow more as a receiver. What do the scouts have to say about Montgomery? He has great balance as a runner. He is able to take contact from defenders and maintain his balance for extra yards. This ability led him to lead all of college football in broken tackles. Montgomery is shifty in the open field, using head and shoulder fakes to freeze defenders for that quick moment before impact. He also shows a decent burst through the line of scrimmage, however he lacks the top-end speed to pull away in the secondary. Although he didn’t really show his pass-catching abilities in college, he does have decent hands out of the backfield and could possibly line up in the slot. Something that he would have to work on at the professional level is his vision as a runner, and picking the appropriate gaps at a more consistent rate. David Montgomery is likely to fall into the late second or early third round. 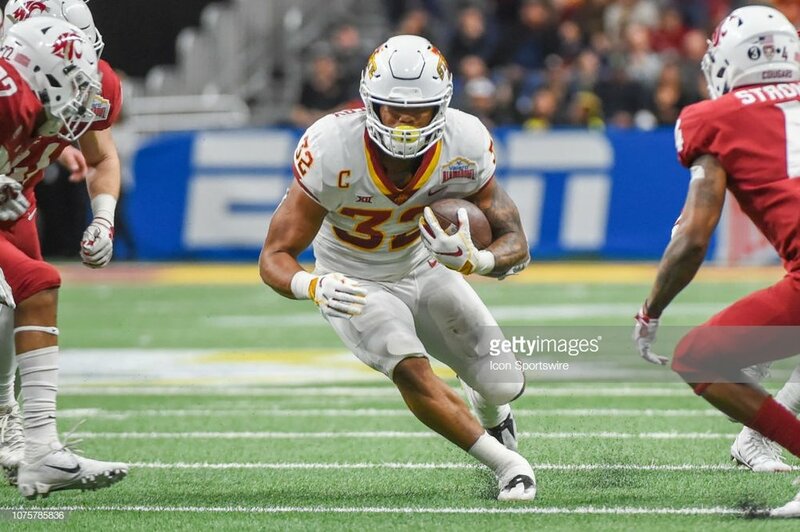 For teams looking for a capable back that can break tackles and get extra yards on the ground, Montgomery is a great selection; For teams that have their number one back and slot options, maybe their pick would be better served elsewhere. I would look at teams like the Buffalo Bills or the Miami Dolphins, who have aging and injury prone starting running backs to land Montgomery for the value. Or he could be the next Le’Veon Bell, what do I know?